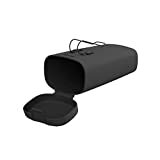 Rubbermaid Mobile Organization 3343-96 Visor Catch-All is a container that secures all of your daily used items in one protected place, contained, and away from the floor. It is designed to store smaller, loose items such as phones, MP3 players, sunglasses, coins etc. Featuring a flip-top lid to keep contents secure, the Visor Catch-All includes a metal clip that securely attaches onto any automotive visor for quick and convenient storage. Rubbermaid, one of just 100 American companies named “Brand of the Century”, has been helping you organize your life for decades. Now, let Rubbermaid Mobile Organize your Life on the Go. ORGANIZATION: Allows for easy access and storage of your small, loose items such as phones or sunglasses. SECURE: The Catch-All clips securely onto any automotive visor. Flips closed to keep contents easy to find and out of the way.